Hi guys! Anyone still watching Dancing with the Stars? My pick is still Frankie Muniz, but he almost went home last night! Can we get Nick Lachey gone? I have nothing against the guy, but he just isn't a good dancer. I had a great weekend just relaxing and enjoying the cooler weather here otherwise. 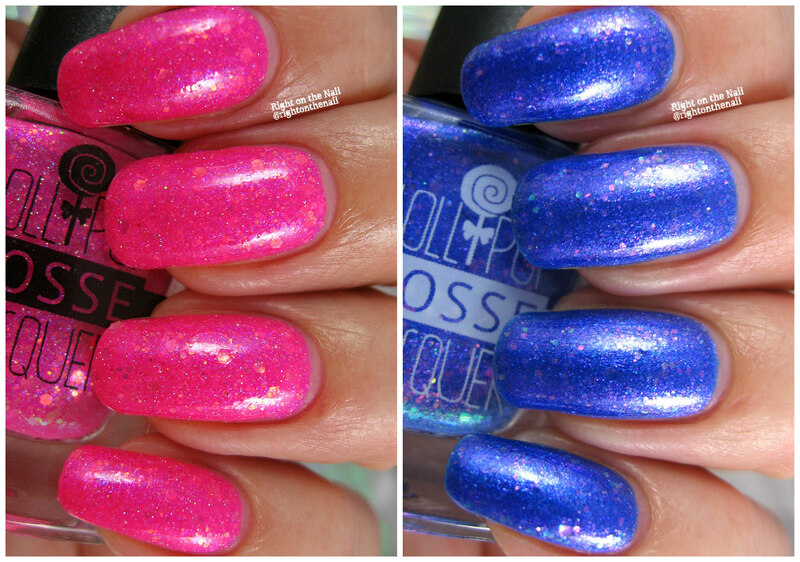 Tonight I have 2 of the 3 Lollipop Posse Lacquer Polish Con exclusives to show you tonight. You may be asking yourself, "Audrey, you didn't tell me you went to Polish Con!" Well, I didn't. I was lucky enough to go to the Indie Shop in Atlanta earlier this year, but I just can't justify flying to Chicago. That said, LPL has the overstock of exclusives on their website right now. Go ahead and press that Read More button for swatches and my thoughts. You know I love a bright pink polish. Cotton Candy Chaos is a bubblegum pink crelly base with lots of iridescent glitter, pink/purple shimmer, and a slight holo finish. If you like simple polishes, this one may not be for you. Thinner coats work best for this one, and I needed 3 coats for full opacity. I recommend a peel-off basecoat if you have it available because this one will be difficult to remove. If you don't have one, the foil method will work in a pinch. I was diverted from O'Hare to Midway in Chicago last year, and it was indeed Midway Madness. I will never complain about the TSA lines in Raleigh. Midway Madness is a cerulean blue crelly base with the same iridescent glitters in Cotton Candy Chaos. My pictures just can't do these polishes justice. It's so hard to show the iridescent glitters, but if you look at the very bottom of the bottle in the picture above, you can sort of get an idea of the color shift in the glitters. This one was more opaque, but I still used 3 thin coats for the swatches. Again, removal is going to be a bit of a pain without a peel-off basecoat. These are still available on the Lollipop Posse Lacquer for $10 each, but stock is limited and they will not be restocked. If you are interested in either of them, you better get a move on! You can find more information about Lollipop Posse Lacquer on their website, Instagram, Facebook, and Facebook Fan Group pages.